‘Touch and feel’ is what the consumers want before they buy their electronics. They want to use and try out the product before spending big bucks. This is what has encouraged the growth of concept stores. It’s a new trend seen in the retail market, especially practiced by the CDIT biggies like Phillips, Haier, LG, Nokia and others. What an idea! Because in a regular multi brand outlet the ‘touch and feel’ idea is lost, and its tough for the consumers to know, which product is best for their needs as they cant use the product on the spot. Also, it’s a rare situation wherein a consumer will get all varieties of products of a brand arranged in a particular area at a multi-brand outlet. Having everything under one roof at experience stores sure helps a consumer to make a better decision. The practice also helps the company to interact with its consumers and make them feel closer to the brand, hence position the brand better. For every store to work it should have some unique selling point; but for concept stores the competition is with both its regular stores and multi-brand stores. “All our products have their own individual USP but overall the USP of Haier brand is its quality, innovation, pricing and customer satisfaction in which we clearly stand out. That is what we plan to sell at our experience centres as well”, said Braganza. These stores give complete solution to the consumers, they not only have the sales model which is to not let consumers go empty handed, but also the emotional model, which is to see a smile of a satisfied consumer. So, how does it affect the business? Does it even give as much as it takes? Do these retailers make good profits? “These stores serve both our purposes – of educating the consumers about the product, as well as assisting sales. We will continue to invest in these stores as it’s a great business opportunity and try to innovate to achieve better results from these in the future”, said Sahay. Sounds promising! 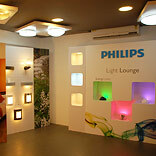 “Philips has more than tripled its range to over 500. All these solutions are available at our Light Lounges. We will continue to invest in increasing our retail presence from the current 183 exclusive touch points (150 Shop-in-shops and 33 Light Lounges) to 450 exclusive touch points (400 Shop-in-shops and 50 Light Lounges) by 2010 end” say Sahay. The CDIT retail has embarked on a new trend to come closer to its customers. Soon not only CDIT but many a categories will foray into the concept stores. Keeping our fingers crossed to see better stores in play that will make shopping an experience for all!